We can no longer deny we love camper vans (well ours anyway) and so we our camper van people! We have had a month attached to laptops back in the UK, focussed on what we know we needed to do but always with an eye on the weather in the Mediterranean. The promise of an Indian Summer and its arrival was not enough to tie us to our bricks and mortar ‘home’. We missed our ‘home’ on the road, we missed camper van life and we missed the heat of the sun, so we packed our laptops and flip flops and headed south again. As usual we set off without a plan, booking our slot on the Channel tunnel as we threw a few shorts, t-shirts and jeans into our bags. We only knew that we couldn’t escape completely ‘off-grid’, we would need to have time, space and connectivity for laptops so wanted to keep it simple. Still we sought a different route through the alps than we had travelled so many times before; we had stopped briefly in Piedmont a few trips ago and enjoyed the wine and food of this stunning and varied region and so, on the French autoroute, we planned to go over into Italy through Piedmont. 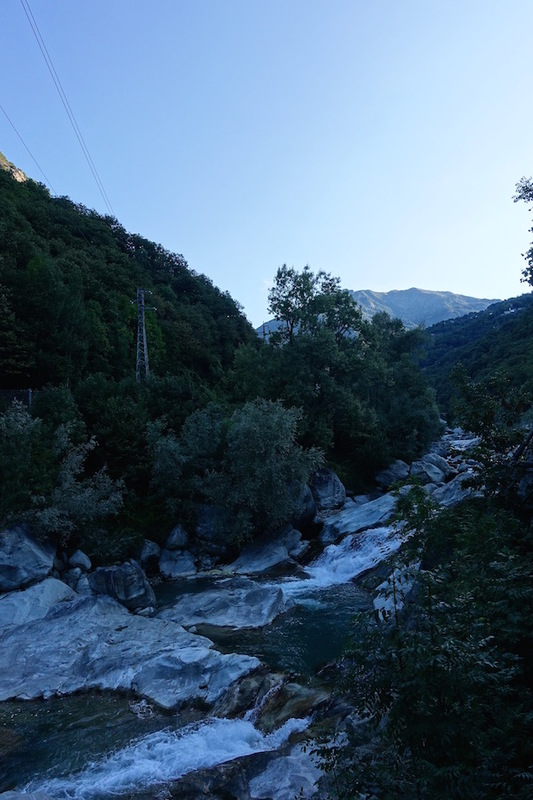 First stop a strangely nice campsite near Fontainemore, squeezed between the quiet road, which wound its way up through the Gressoney valley, and the river that tumbled noisily along the gorge over stark, smooth white boulders. The only other camper van people we saw during our stay were two melancholy, empty handed, fishermen who trudged up from the river, heads down, into the campsite at sunset. Our spot for the night a little grassy oasis between two empty, permanently pitched, vans with an amazing view one way to the mountains beyond and the other down to the river. We didn’t mind at all having this place to ourselves, our own little camper van peace of heaven. An evening of wholesome food and relaxed chat, the otherworldly feeling of this peaceful valley I think had physically and emotionally disconnected us from distractions that may lurk in our laptops, topped off a long day of travelling beautifully. When the Italian stews of local sausages arrived in their rustic pots, along with a huge portion of polenta baked with Fontina cheese, the conversation did halt for a while as we let our taste buds explore and were delighted once again by the enjoyment we can always find in simple but extremely well done local food. The next evening’s stop was a complete contrast, equally as strange yet so different in many ways. 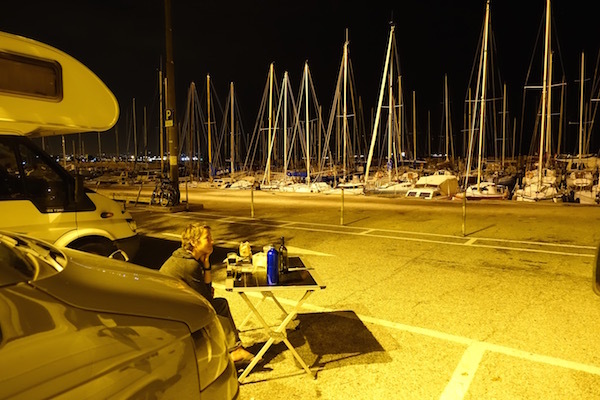 Trieste was unavoidable on our way to Slovenia and on to Croatia but not really top our list of places to stay (having both visited on business) however as we approached along the coast (seemingly devoid of campsites) we spotted several campers in a car park by a small marina. Luckily there was a space so we squeezed our little van between the slab sided motorhomes and investigated. For an unknown reason these 10 or so spaces, at the coastal edge of a car park, are designated for campers. It’s a great spot just north of Trieste by a lovely harbour and a long promenade which stretched back up the coast to the Castello di Miramare. 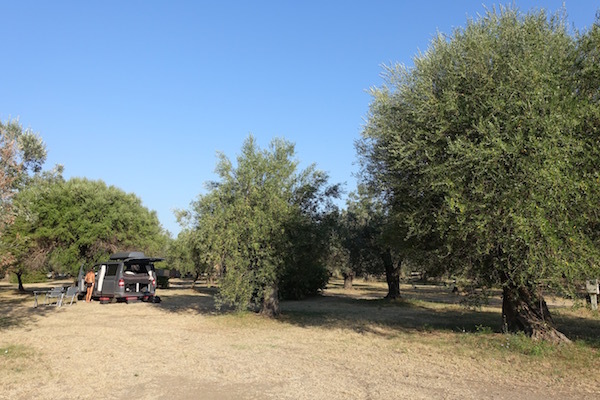 Certainly not the usual secluded and peaceful ‘camp’ we search for but we had a great view, a place to walk and jog and most fascinating, the people we met during the evening… the row of campers as diverse as their owners. Two, very swish second-home type vans, who travelled together, whose owners spent most of their retired time out of the uk exploring. For several years exploring Spain and Portugal, they had decided to try Italy and Croatia. We thought it very inspiring and amusing that one of the couples had the lady’s 97 year old mother with them. ‘She’s in a wheel chair and has a colostomy so can’t go particularly fast or far from the van,’ John explained with a smile ‘we told her she could either come with us or go in a home!’ and so they travelled together, very happily it seemed, the three of them and their funny little dog. There was another British camper van that had travelled through here before and used this as a base for Trieste city. He was very clued in on local parking etiquette and held us and others decipher the ambiguous signage. A Luton van, converted into a custom camper van, belonged to a young guy who had set off at the beginning of the summer from Headington in Oxford (a very small world since we moved from there only a year ago). He had made this space by the harbour his ‘home’ in his camper van and was keenly learning Italian, probably driven by his beautiful, ever present, Italian girlfriend. An Italian lady had discovered the parking spot on the internet she told us and was a little disappointed that she couldn’t find a space. The car park was a local’s favourite too it seemed, as car after car filled the spaces around us spilling out sprightly couples in running gear, who jogged and stretched (in a stylish way that only Italians can) and then disappeared again. 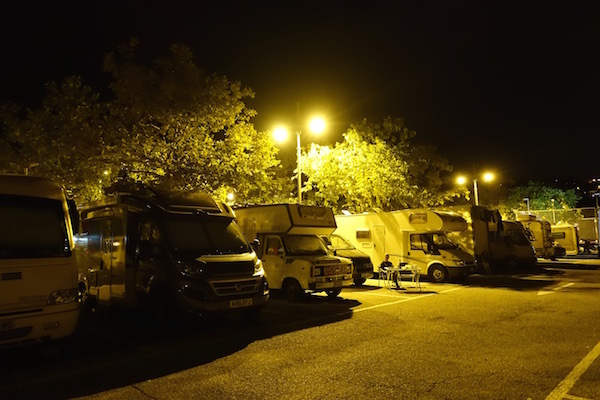 The Italian lady’s van and a couple of German campers circled like vultures, grabbing the spaces as soon as they were vacated and then they too joined the motley club of camper vans. The most intriguing camper people were those in the van next to us. A battered old Italian camper van that looked almost rooted to its space. The dusty windows were open but it remained dark behind the nets that wafted in the sea breeze and none of us ever saw a soul, though we all had our imaginations painting pictures of who our mysterious neighbours might be. We shared stories and tips, finding something in common despite the diverse backgrounds and ages of the ‘camper people’. John came back to ask us more about Croatia and then beckoned his navigator / wife, ‘ I just drive’ he said ‘I have no idea and no say in where we actually go!’ Pauline swaggered across, it looked like she had enjoyed almost as much wine as we had, dragging their little white dog behind. We pointed to a few places on the Croatia map, ‘Hang on, I need my glasses and my notebook’ she said and before I knew it I was standing in a car park in Trieste, between two big white camper vans, holding the lead of a little white lap dog! In the morning we explored as far as the castle, Castella di Miramare, with a jog along the promenade and a quick dip in the sea before all the camper vans, almost in unison, set off and all went our separate ways. We couldn’t miss the chance of living like a local and relaxing near Rome. Our sketchy plan since setting off from Oxford included seeing our two lucky friends who live in Rome, or at least in an ideal location near Lago Bracciano just to the north west of Rome. This visit was more about catching up with our friends rather than seeing Rome. Adam and I have visited Rome on other occasions and Gary and Donna have worn out the circuit with various visiting friends and family. It didn’t take us long (less than half a glass of wonderful, local Lazio red wine) to agree that we should simply do the things we all love doing; eating, drinking and walking. 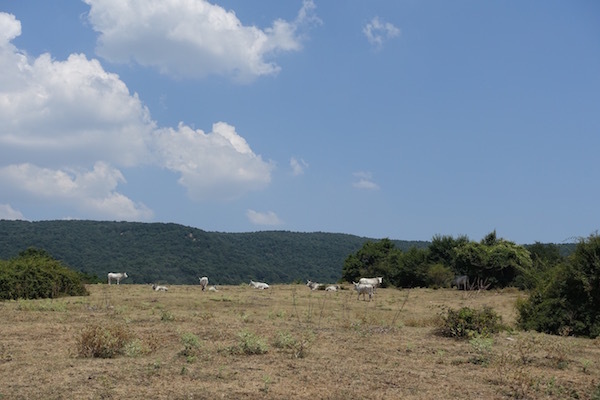 We had a fabulous walk in the nature reserve at Monterano and around the beautiful countryside there, not seeing another living soul other than rather splendid looking Maremmana cattle grazing on the dry grass on the hillside. Adam did tell me they were too far away for a great photo but I wasn’t keen on getting much closer. The walk took us to the fascinating ruins of Antica Monterano. No time for photos unfortunately we were all rather hot by the time we got there (we’d chosen midday to set off again and the temperature was already showing 32 degrees Celsius when we left the house). 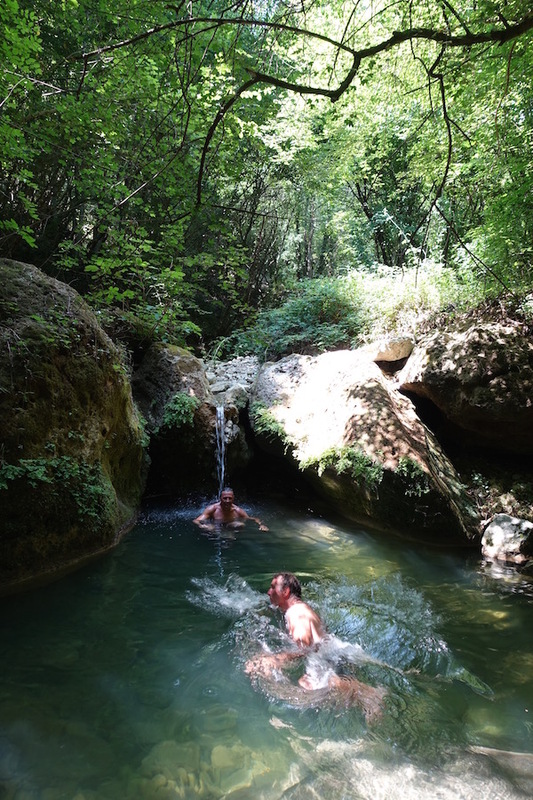 As we neared the end Gary took us to one of his favourite spots on the walk a welcome fresh water pool where we all took a dip and enjoyed a little wild swimming to cool off. By the time we had walked back, past the sulphur springs and up to the car we were completely dry and ready for a cold beer. 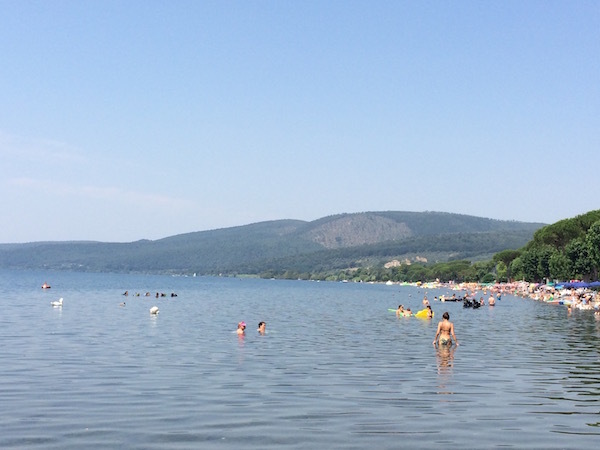 A much more sedate day next at Lago Bracciano, a beautiful and rather surreal place. We went straight to a pebbly beach (fairly quiet and equidistant between a bar and a restaurant so easy to see why it is Gary and Donna’s favourite spot there). 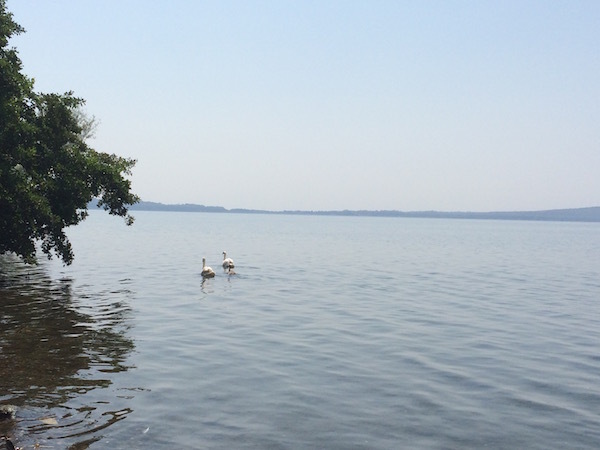 The beach was scattered with sunbathers and in calm, clear waters, lazy swimmers floated strangely amongst fully wet-suited divers and between everyone, several swans and their signets glided serenely by. A wonderful few days, providing an insight into a local life, playing and working in the sunshine. 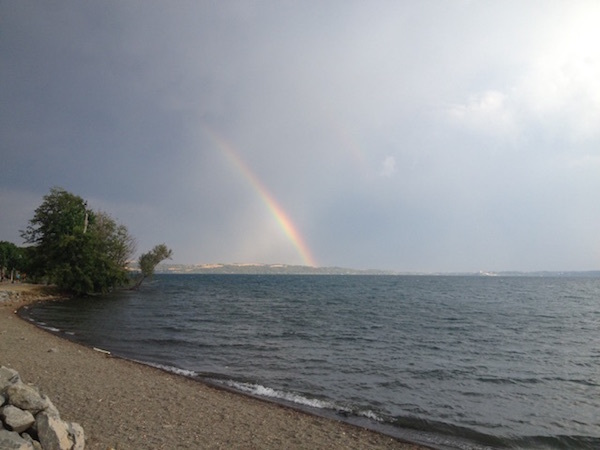 As we headed off north again, we were all envious of each other, the extensive diversity of what we (Adam and Helen) had seen on our journey contrasted with Gary and Donna’s deep understanding of and familiarity with the beauty of a single location. Adam and I had enjoyed living like locals and relaxing into the pace of life in Rome. We concluded that a balance between the two would probably suit us well. 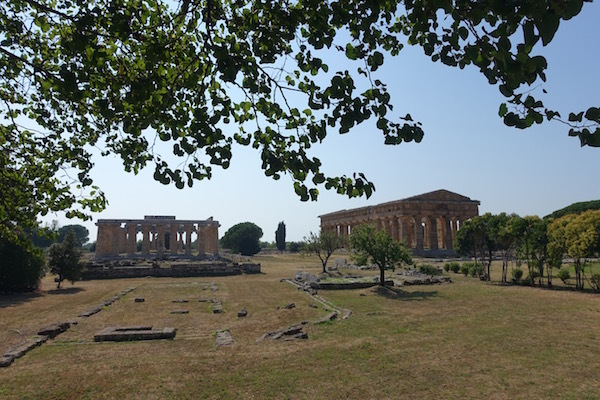 We knew near Paestum we could see the Greek ruins and Mozzarella of Campania but first we wanted to explore Agropoli; the medieval old town that we missed the day before as we searched for our beach hideaway and to experience it in the evening. Our map showed a campsite in Agropoli itself but this was not to be found anywhere rather we found a great little camper place at Trentanova, just a couple of miles walk back into town and actually, with its own pleasant village where you find a great delicatessen and a bar restaurant. Camping Trentanova was a pleasant surprise at first it looked like you would be parking in a disused industrial ground with a huge barn welcoming you to the site but the good mix of sun and shade below the Eucalyptus trees and absolutely amazing, pristine, beautifully decorated toilets, showers and washing up area made it a great base from which to explore Agropoli. Our first experience of Agropoli was the day before as we had passed through at the beginning of our testing Cilento coast day. As we entered the narrow streets of the ‘new town’ at 8am it already had a charm and bustle about it. 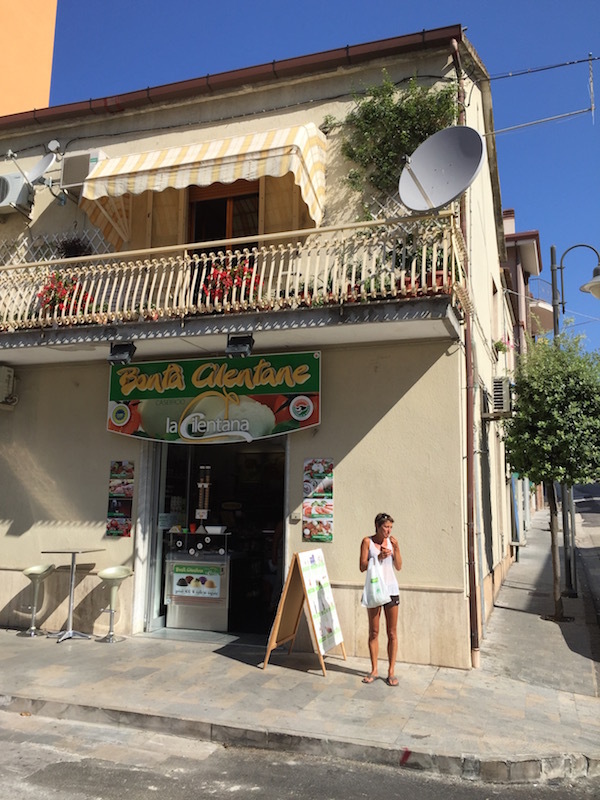 After breakfast, coffee and Coronette (Croisant) in a friendly little bar close to the centre, we noticed a delicatessen type shop that sold mozzarella so went to investigate. We couldn’t see any at all amongst the great selection of cheeses behind the tiny counter but the lady old us there would be a new delivery in 5 minutes. We wandered further, buying more wonderful plump Italian tomatoes (our rule is that you can never have enough tomatoes) and returned to the little deli 10 minutes or so later to find a queue out of the door. 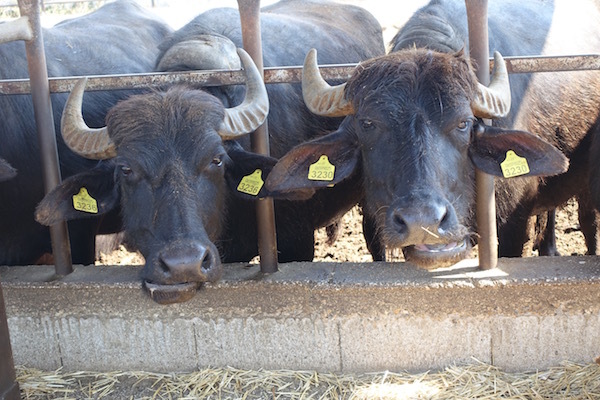 The Buffalo Mozzarella had arrived and the locals obviously knew that it did so every day at that time and that the early bird catches a very fresh and delicious mozzarella. We bought our precious ration and couldn’t resist just a taste of the buffalo milk ice-cream too. After a lunch at the van of our wonderful Mozzarella, fresh tomatoes, (too much) Greek Rosé and delicious melon, we lazed in the sunshine rather than risk any crowds at the beach. 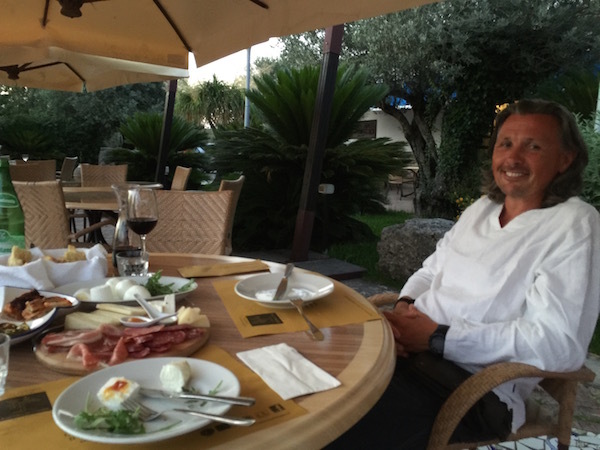 Later as the sun dipped, we scrubbed up and flip-flopped into Agropoli for dinner. It was then 9pm and the streets were full of life and intrigue. The fresh fish shop had tables outside where a few enjoyed dinner, the fruit and vegetable stores cascaded colourfully onto the street and the smell of wood smoke from the fresh baked pizza ovens filled the air. As we approached the central square, the sound of hundreds of people promenading, dining and taking in the warm night air gave the town a vibrancy we had not expected. We strolled, mingled and had just slowed to their pace when the power to the whole town failed; screams and giggles filled the square and a multitude of mobile phone lights soon lit up the evening. We continued slowly in the dark weaving our way through those paralysed by the dark and eventually found a little restaurant where emergency lights and gas stove meant they could still serve us a great Spaghetti Vongole (clams) and Frittura Mista (wonderful lightly battered and quickly fried calamari and little fishes). The lights came back on again a few hours later allowing us to find the way up to the old town and explore the cobbled streets, a beautiful and intriguing place but still packed with people at midnight. A fascinating evening to end our few strange days and now we had seen (sort of) Agropoli and the old town, it was time, we both agreed, to leave the Cilento Coast and head north. Not an easy decision as any direction north now meant closer to home. before a delicious feast of cheese, meats and of course wines from the farm. Next stop Rome to see our friends, who have rather fortuitously found themselves living there, so in the morning we bought a huge (500g) Mozzarella, local Aglianico wine for them and filled our fridge with a few of the cheeses from the shop before, sadly now, saying goodbye the Paestum Greek ruins and to Campania.